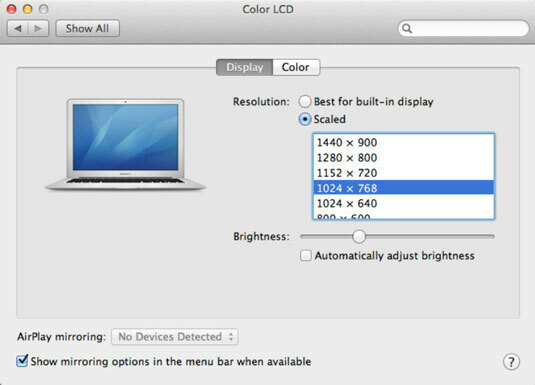 Display: To allow Mountain Lion to choose the best resolution for your display, select the Best for Display radio button. To manually select a resolution, select the Scaled radio button and then click the resolution that you want to use from the Resolutions list on the left. (In most cases, use the highest resolution.) Move the Brightness slider to adjust the brightness level of your MacBook’s display. On the road again? Select the Show Mirroring Options in the Menu Bar When Available check box if you’ll be using multiple monitors or a projector with your Mac. Ready to stream content to your TV directly from your MacBook — without cables? You can use Mountain Lion’s wireless AirPlay Mirroring feature to send the display from your MacBook to your HD-TV. AirPlay Mirroring requires an Apple TV unit that supports this feature. You can also send the audio from your laptop directly to an AirPlay-enabled receiver or speaker system. Color: Click a display color profile to control the colors on your monitor. To load a profile, click the Open Profile button. To create a custom ColorSync profile and calibrate the colors that you see on your monitor, click the Calibrate button to launch the Display Calibrator. This easy-to-use assistant walks you step by step through creating a ColorSync profile matched to your monitor’s gamma and white-point values.